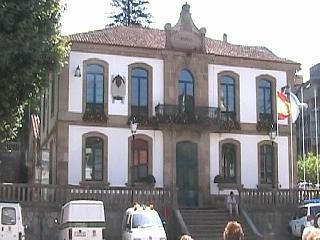 Daniel Alfonso Rodriguez Castelao is Rianxo's most famous citizen and indeed the town's greatest claim to fame is its location as his birthplace. 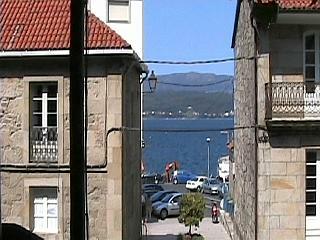 Rodriguez is known throughout Galicia as the "father of Galeguisomo" (Gallegoism). 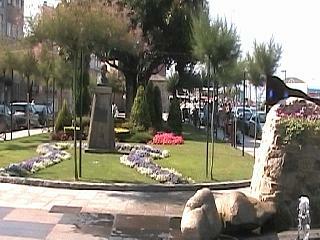 Below, the bust of Rodriguez at the sea front in Rianxo. Rodriguez, who was alternatively a politician, writer and artist, started a movement centered upon the promotion of everything Galician. His basic premise was that all Galicians should be proud of their heritage and embrace it in every way, from speaking the distinctive tongue of Gallego, to living a Galician lifestyle. He also promoted and reinforced many of the Celtic connections that modern Galicia holds so dear. Many also attribute the mind set of being a Galician first and a Spaniard second to Rodriguez. Today he is perceived as a modern day Galician hero and statues of him exist not just in Rianxo, but elsewhere in Galicia. Leaving the narrow tiled and lawned area that is sandwiched between the town and sea, you can enter the main hub of Rianxo via any number of narrow roads (many now pedestrianized) that take you up a slight incline and into Rianxo itself. 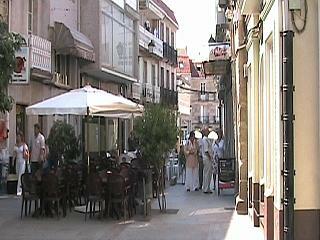 Right, a typical street scene in Rianxo where you can wonder round or break for a coffee and some tapas. The main part of the town, or at least the part with the greatest tourist appeal, stems from the first street you reach which runs parallel with the road leading to the harbour's dock. Once on this street you get continual views back to sea at each of the roads intersections and it is also from this lane that you can get to the "alameda", town hall, tourist office and historic district. Below one of several glimpses back to the sea that you periodically get as you wonder around the elevated part of Rianxo. Rianxo has no shortage of cafes and bars and those that we saw at the sea front were more than matched in number by others that lay, set back, in the main town. In keeping with so many similar port towns, Rianxo is built into a hill in tiers with streets running either roughly parallel with the harbour, or at right angles to it. As you move up another level to tier two, you reach the alameda which has a stone town hall (illustrated below) at one end and several café bars opposing it. It is at this point that you can go to the left, or more profitably to the right and explore the remainder of the town. 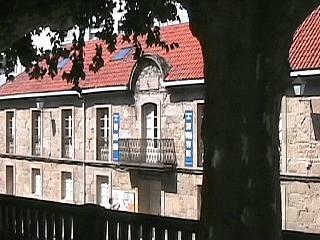 Alternatively, and probably advisably, you can also climb up one further level to a secondary square, cloaked with trees, that is the site of Rianxo's wooden tourist office. There are no English speakers at this office, but the enthusiasm and helpfulness of the lady who was there at the time of our visit more than compensated for that and we left the insignificant looking cabin with masses of information. Above this point is the pinnacle of Rianxo's (actually a playing field) which you can reach by climbing a couple of flights of steps from which you can just about see over the roof tops below to the ocean beyond. The building shown to the left overlooks the alameda, but the photograph itself was taken from the next level above the alameda at which the tourist office is located.